2006 was a big year for Marvel Comics. Three major events were held that year: Civil War, Planet Hulk and Annihilation (Neil Gaiman's 12-issue series The Eternals also debuted that year but is not considered to be as big of an event). I latched on to Civil War without any hesitation. But when it came to the other two, I had no interest. That is, until I read the positive reviews of what I was missing. Now since I’m in the class of the “Wait For The Trade” kind of reader, I did exactly that. The Planet Hulk Hardcover was simply awesome. The story, the art and the extras that were included in the collected edition made it one of my favorite collected editions that were published in 2007. As for Annihilation, I was intrigued as to what all the fuss was about. My knowledge of Marvel Cosmic is limited at best, but Keith Giffen and Andy Schmidt, who plotted the massive series (three hardcovers total) made it easy to get on board and up to speed with all the characters involved. I have since purchased the sequel, Annihilation Conquest, and both spinoffs, The Guardians of the Galaxy and Nova, all in hardcover form. Nova, aka Richard Rider, was of particular interest. He was a thirty-year-old character that, for the majority of his career, had been either misused or forgotten altogether; but not anymore. Nova has turned out to be a surprising bright spot in the myriad of over 100 titles that Marvel sells each month. Blazing through the truly extended Marvel universe, I craved more of this character. So I went back to the roots and picked up the black-and-white Essential Nova Volume 1 (original series from 1976-1978), which was published during Annihilation to garner more sales. I did come to find his origin and rouges, but sadly I did not find a history of the Nova Corp and a deeper understanding of Nova, himself. After reading the more modern version, I guess my expectations were too high. What I did find was a mash-up of Spider-Man, a troubled teenager with extraordinary power, and Green Lantern, a human that gains a gift from the stars. And just like Abin Sur falling to Earth, the dying Nova Prime, who is flying his space ship past Earth, must find a successor. The task falls to Richard Rider, a typical high school kid with typical high school kid problems. Ryder takes on the “Peter Parker/Hal Jordan” role and gains power and knowledge beyond his comprehension and since Nova Prime is dead, there is no one to guide him. Rider, now simply called Nova, attempts to emulate his idols like The Avengers and becomes another superhero in New York City. Like the other Marvel comics being published in the 1970s, including Luke Cage and Iron Fist, Nova battles second rate criminals and for the most part finds himself in some sort of cliffhanger predicament at the end of the book only to find a way out in the first few pages the following month. Some of his rouges are Condor, Powerhouse, Doctor Sun, Diamondhead and The Sphinx, who turns out to be the magician of Pharaoh Ramesses II who tried and failed to help defeat Moses. As punishment, he was immortalized and banished to roam the Earth for all eternity. Strangely, I found myself wanting to watch The Ten Commandments with Charlton Heston and Yul Brynner. Possibly the hardest thing for me to grasp out of this was that Nova never tried to learn more about the Nova Corp or how to control his suit even though the data was inside the Nova Prime ship which was still in orbit. It took the doings of the villains (twice!) to get him aboard. Overall, the comics books contained in the Essential Nova Volume 1 are fine and I don’t think you need the color or inks to get the full story. The monthly books move at a good pace but I could do without the Page-1 recap at the beginning of each installment, a common practice at the time. You can also tell that the Marvel editors predicted that this series may have a slow down in sales and to counter that they inserted heavy hitter characters like Thor, Iron Man and teamed him up with The Thing. Nova even had a two-part crossover with Spider-Man. The biggest disappointment comes not with the cancellation of Nova’s series, but with The Essential Nova Volume 1, itself. Due to poor sales Nova ended abruptly with issue #25 in 1978. The ongoing plot was continued in Fantastic Four #206 (1979). Although Nova only made two more appearances in Fantastic Four (#208 and #209) it would have been nice to of had those included. On a side note: the Nova plot and the Fantastic Four plot merged; the complete Fantastic Four story ran from #204-#214 (that complete storyline has not been collected). Another book that is missed is Rom #24 (1981), but due to copyright issues it cannot be reprinted. Nova made a few brief panel cameos in Daredevil #142, Thor #271, and The Defenders #62, but not enough to warrant an inclusion in this Essential. 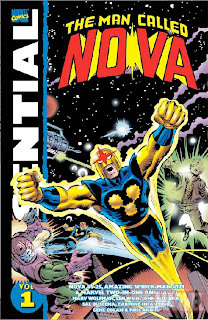 So if you are a fan of the current Nova series and want a little history to get you up to speed, pick up Annihilation Classic, which reprints the first appearances of Nova and his Marvel Cosmic friends. Then, and only then, if you have time to kill, pick up this book. I'm excited about coming to the new stories; who would've guess Nova would appear in three series in the summer of 2010? The lost opportunity with the ship and Centurians looks like Wolfman was just about to tie them in...when the book's cancelled. The strong point probably was his supporting cast, early on. He may be depressed at times, but no Marvel hero ever had more of a normal life than Rich, with friends and family constantly in the picture. For you and those interested, I've been chronicling these original issues and adding essays in between in places. You can enjoy them at integr8dfix.blogspot.com if you like!